Boasting a simple and authentic charm, Castilla-La Mancha is regarded as a secret paradise for Spanish property buyers who appreciate the region’s outstanding countryside, wildlife and cuisine, along with the tranquil way of life. Situated in central Spain to the south and east of Madrid, Castilla-La Mancha is a captivating land of contrasts, with dramatic landscapes and unspoilt natural beauty, as well as a rich artistic and cultural heritage. It is a varied landscape that ranges from flat, undulating plains of henna-coloured earth crossed by olive groves, to fields of waving wheat and vineyards, along with lush forests, mountains, scenic gorges and rushing waterfalls. The internationally acclaimed filmmaker, Pedro Almodóvar, who was born in the region, describes "the red land, the yellow fields, the ash-green olive groves and the patios, full of life." Castilla-La Mancha is also where the story of the famed Spanish novel, Don Quijote, is situated. It is one of the world’s great literary masterpieces, written by Miguel de Cervantes. The region, with its vineyards, sunflowers, olive and almond plantations, iconic windmills, castles, and Don Quijote, remains a symbol of Spanish culture . Thanks to the great variety of natural splendour, Castilla-La Mancha is one of the European regions with the most conservation areas and national parks. It is an environment of outstanding beauty well worth preserving, as was recognised in 1980 by the creation of a World Biosphere Reserve out of Tablas de Daimiel National Park, Lagunas de Ruidera Nature Reserve and the entire transitional zone between them. Then, in 2014, UNESCO went even further, expanding the protected space so that La Mancha Húmeda now covers an area of more than 400,000 hectares. An environment of outstanding natural beauty, the area is surrounded by sensational highlands, the limestone cliffs of Cuenca, the mountain peaks of Sierra de Alcaraz, the olive orchards in Alcarria and two amazing rivers, the Tagus and the Guadiana. >Culture and history lovers will enjoy the region’s five Archaeological Parks, with some of the oldest examples of rock art in Spain, and events such as the International Classical Theatre Festival in Almagro. Hikers and cyclists adore the region. There is the Don Quijote Trail that covers the various significant landmarks Cervantes described in his novel. As well, there is the Ruta de los Pueblos Negros (Route of the Black Villages), the Route of the Saffron Fields and the Route of the Castles. Golfers love the area, too, with courses including La Vereda Cuenca, Palomarejos Golf Talavera de la Reina and Las Erillas Nuño Gómez. And fisher-men find species such as the barbel, pike and carp in the many lovely lakes in the region. Of major interest are, of course, the monumental cities and towns of great historical importance, such as Toledo and Cuenca, which have been awarded World Heritage designation by UNESCO. Toledo – the region’s crowning glory – is considered one of the most splendid cities in Spain. With an atmosphere of an open-air museum, the historic town is crammed with architectural treasures and magnificent monuments from the Moorish, Mudéjar, Gothic and Renaissance periods. Another wondrous place, Cuenca, is marked by its picturesque and authentic centre, marked by an imposing Gothic cathedral. Most striking, however, are the town’s 15th-century casas colgadas, or hanging houses, which cling precariously to cliffs 200 metres above where two river canyons meet. Castilla-La Mancha is also the powerhouse of the Spanish wine industry. It is Spain’s largest winemaking region, producing over half of the country’s wine. The wines run the gamut from fruity, value-for-money varieties to top-quality small-batch varieties created with the use of experimental techniques and unique varietal clones. As well, there are more than a dozen top Spanish bodegas, or wineries. In total, the region is a haven for wine lovers. The area is also known as a modern agribusiness success story, with the local sheep’s cheese, Manchego, a significant Spanish export. Apart from good connections to Madrid, there are regional airports at Villanubla (Valladolid), Virgen del Camino (León), Salamanca and Burgos. To date, Castilla-La Mancha property has remained virtually untouched by tourists and property investors, attracting mainly Don Quijote fans, adventuresome wine connoisseurs and lovers of culture who are looking for the authentic Spanish lifestyle that exists away from the Costas. 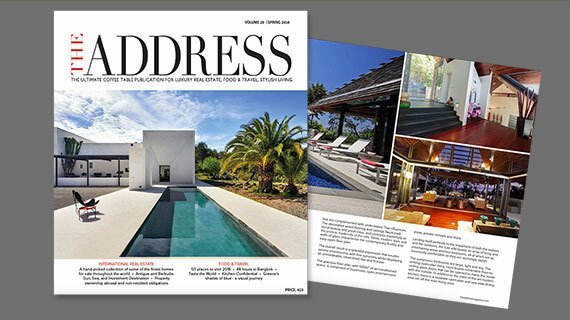 Read more about properties in Castilla-La Mancha in THE ADDRESS Magazine.